FORT LAUDERDALE, Fla. — The sheriff leading the state commission investigating Florida's high school massacre says he now believes trained, volunteer teachers should have access to guns so they can stop shooters who get past other safeguards. 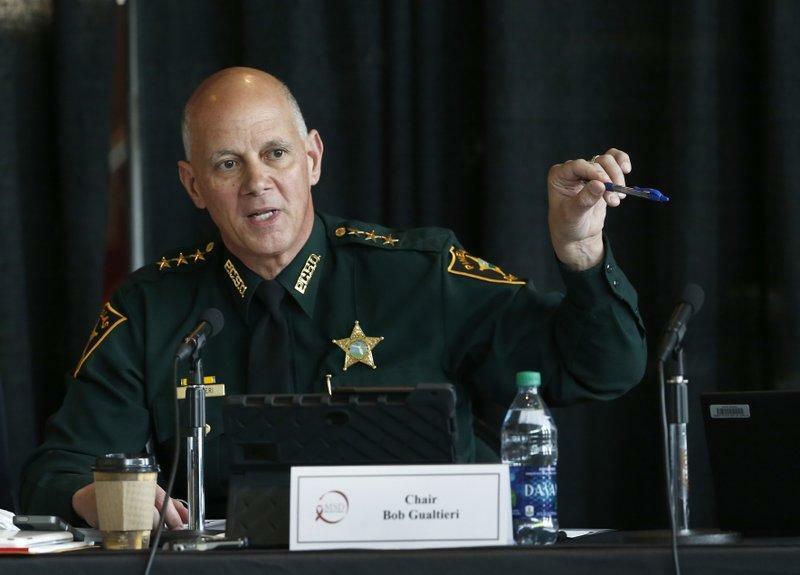 Pinellas County Sheriff Bob Gualtieri, chairman of the Marjory Stoneman Douglas High School Public Safety Commission, said he will ask the panel to recommend state law be changed so teachers who undergo background checks and extensive training will be allowed to have guns on campus as a last line of defense. It's a proposal that both the state teachers union and PTA oppose. Gualtieri told The Associated Press this week he long believed only law enforcement personnel should carry guns at school, but his position "morphed" after studying other shootings and watching security video of the Feb. 14 Stoneman Douglas attack, which left 14 students and three staff members dead. He said it "gnaws" at him that suspect Nikolas Cruz stopped firing five times to reload his AR-15 semi-automatic rifle, but no teacher or other school employee could use those pauses to shoot Cruz. The athletic director and a coach, both unarmed, died trying to stop Cruz and at least one teacher minutes later would have had a clear shot. Meanwhile, video shows the Broward County sheriff's deputy assigned to the school drew his gun but stayed outside. By the time other law enforcement arrived, the final fatal shots had been fired. "We know from the history of these things that the majority are stopped by school personnel," Gualtieri said, pointing to shootings where the gunman was tackled or disarmed by a teacher or campus employee. "People need to keep an open mind to it as the reality is that if someone else in that school had a gun it could have saved kids' lives." After the shooting, Florida law was changed to allow school districts to train and arm employees other than teachers, including administrators, librarians and custodians. Teachers are barred unless they are former or current police officers, current members of the military or Junior Reserve Officer Training Corps instructors. Thirteen of the state's 67 countywide districts adopted the program, mostly in rural parts of the state. "Teachers should not be acting as armed security guards. The majority of our members don't want to be armed — they know it would be impractical and dangerous," union spokeswoman Joni Branch said. Angie Gallo, the state PTA's legislation chair, said only law enforcement should carry guns on campus. "Teachers need to teach," Gallo said. "Their job is not to secure our schools. It is not to shoot at shooters." Other members of Gualtieri's commission, including Polk County Sheriff Grady Judd, have expressed support for arming teachers, although it is unclear if a majority agrees.